Who’s to blame for the sad state of the American health care system in 2017? 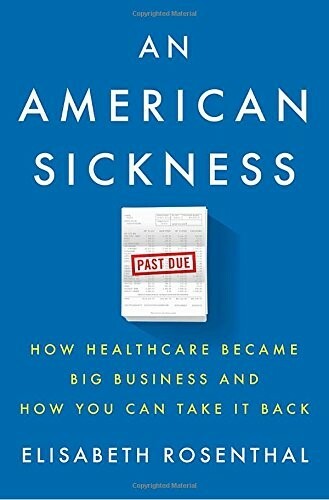 The short answer, as Dr. Elisabeth Rosenthal details in her new book “An American Sickness: How Healthcare Became Big Business and How You Can Take It Back,” is profit-chasing professionals in almost every corner of what’s become a massive industry. Prices will rise to whatever the market can bear. The Fiscal Times spoke with Rosenthal about the evolution she describes, the options for reform and why she writes that patients must “change our ways too.” The transcript below has been edited for length and clarity. Q: My father retired recently after almost 50 years as a doctor. Before he did, he wrote a letter to his patients and his colleagues decrying how the “caring profession” he entered had changed in recent years. Has that all been driven by a profit motive working against the interests of patients? A: It's obviously a complex interplay of forces. I don't think everyone has to be Mother Teresa, obviously, but that tradition of medicine and the gratification that doctors got from interacting with patients and feeling close to them and helping them has been lost in the kind of commercial systemization that we've seen. It's not always the direct profit motive that changed medicine. It's also thinking of medicine as another commercial endeavor, so you try and apply things that work in business: optimization, revenue management, maximizing time efficiency. And those don’t always translate very well into patient care, either for physicians or for patients. I hear from doctors saying we don't do things just to make a profit. Fair enough. Doctors don't sit there and think, ‘I'm going to do this surgery because I have a mortgage to pay or I want my kids to go on that summer program,’ but it's really a kind of insidious slow creep of profit or money as a consideration. Q: How different is the evolution that you're describing from what patients in other countries experience? And how useful is it for Americans to look at how health care works in other places? A: The perspective from overseas does help in the sense that it tells us it doesn't have to be this way, and we are not getting value for all the money we spend. When you look at those hospitals and those doctors’ offices overseas, they don't look like hospitals in the U.S. Our hospitals — we expect them to look like five star hotels. They have beautiful lobbies and free coffee. Hospitals in most countries look a little bit like junior high school. They're pretty basic. And I think we all have to ask what we're paying for and are we paying for the right things. Q: To what extent is the state of our current system a political problem — something that our politicians haven't been able or willing in some cases to effectively address? A: There's an incredible amount of lobbying that goes on around health care. If not the biggest, it’s one of the biggest lobbying forces in D.C., and that makes it very hard to cut back on what we spend on health care. The other problem is we've let perfect be the enemy of the good. I mean we could save a significant amount of money if we just did something, but because there's all this political bickering about what kind of something we should do, we end up choosing none of the above or not being able to agree on anything that really moves the needle on cost. Q: You seem to be advocating a more gradual and incremental approach to reforming the system. To what extent is that because the political system makes it impossible to have a more comprehensive overhaul? A: I always like to say I am a journalist and want to remain a journalist. So it's not my place to say what the answer should be for the United States. But I think it's not so much that I favor incremental reform, but dramatic reform is practically very difficult because we can't even agree on undramatic reforms so far. I also think we have to be cognizant of the fact that health care has been a big job creator for the U.S. and so much of our economy depends on health care. If we say we want to right-size the system, if you do that abruptly or in cities like Cleveland and Pittsburgh where a huge percentage of jobs are in health care now, that would mean huge job loss until people can be redirected. Health care brought us out of the recession. And I wouldn't want it to put us back in the recession. Q: Your book’s 10 economic rules illustrate how medicine is different from other markets — and that a free-market system might not work. So does that mean that you have to have some sort of government involvement or price controls for health care to be affordable? A: It's a good question, and that's what the Republicans are bumping into right now. It's really, really hard without some form of more direct price control. A totally free market doesn't work because we don't choose to be sick. So even in countries that we think of as market-based health care like Switzerland or Japan, where there's a single payer, there is some kind of rate-setting. Q: In the second half of your book, you have a lot of useful information for people about how to pick a doctor and what to do to avoid unexpected costs when they're hospitalized. But overall how much power do patients really have? And is it fair to make them have to ask whether they really need a specific test or a scan or to track everything that's happening to them when they're hospitalized? Q: Do you think that more educated consumers of health care will have a collective effect in changing the system? A: If I need an X-ray of my wrist, I want my doctor to know which of the 50 X-ray facilities in New York City within a mile of his office are good and cheap, and I want him not to send patients to the one that's charging the most. Probably today he doesn't know that information. But if people start asking, he may be forced to learn it, and that will be good for the system. Q: From the patient’s perspective, there is every incentive to get the extra treatment, and you have to balance that against the costs. And as you describe in your book, patients are often blind to that cost. A: It's terrible to put these burdens on the consumer. Also, doctors are in a difficult position in those kinds of situations because, again, it's this business model of medicine: The patient is the consumer and the doctor is trying to satisfy the consumers. This is why we have all these ads, ‘ask your doctor.’ So the patients go in and ask the doctor for medicine. The doctor thinks, ‘Well, that's probably not useful, but here I have a patient asking, and I don't think this medicine will hurt.’ So they order it. They're in a really tough spot, and they are facing in the back of their minds what if I end up in court over this. Even more pressing for a lot of physicians now is that physicians are rated on Yelp and all these rating sites and by their own hospitals. And patients tend to like people who give them what they want. That's part of why I say we have to think differently about patients as kind of partners with our physicians and not as outraged consumers. There is this mentality we have as patients of ‘I want this fixed, and I want it now, and I want to understand what the problem is today.’ That may not be good care. Q: I take it that also means that more awareness and sensitivity to costs among patients will actually help. At least that’s what we keep hearing. A: It's kind of a fine line, though. We keep talking about how it's good to have skin in the game, which is kind of true. It's true in the sense that it makes people at least conscious of costs when you haven't met your deductible. But there's also a limit to that because the costs for certain things are so very high that skin in the game can be $5,000 or more. It's really unpredictable. So if by having skin in the game you're encouraging patients to avoid getting care that they actually need, then we're in big trouble. Q: Ultimately, do you think that we will get to a point where we do have a “patient-centered, evidence-based” health care system, or at least a system where people have quality care that they find affordable. Are you optimistic that we might get there within, say, a generation? A: Yes, partly because I'm an optimist and partly because the track we're on now is so dramatically unsustainable both from an individual standpoint and from a national standpoint. I speak to people who are now spending 20 or 30 percent of their household income on health insurance and minor health costs. That's more than their mortgage, more than their food. That's really not sustainable. So I do think there will be some solution. It's very hard to predict where the change will come from, but we're at a point where not addressing this cost issue just is not practical. It will gobble up the entire federal budget pretty soon.